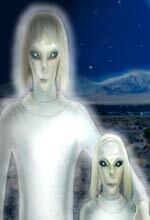 IF YOU COULD TALK TO AN OTHER WORLDLY TALL WHITE, WHAT WOULD YOU ASK? In this 3 part series, Jamie talks with two Tall Whites. Their energy is extremely calm and Jamie states she feels as if she is hypnotized (she is a hypnotherapist and studied under Dr. Brian Wiess). She has trouble communicating with them, so at times she turns to Erik for assistance. The series is definitely worth listening to if you have questions about why extraterrestrials are here, what are they like as one example of the members of Creator Mother/Father God’s family? Jamie’s assistant asks the very questions you likely have! Filed under: Jamie Butler, Tall Whites |	Comments Off on IF YOU COULD TALK TO AN OTHER WORLDLY TALL WHITE, WHAT WOULD YOU ASK?